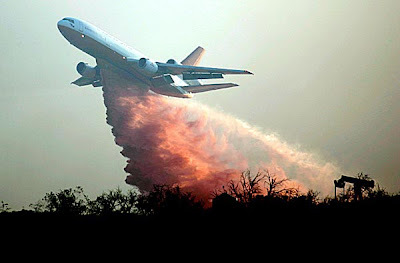 A DC-10 drops fire retardant on the hillside by Grimes Canyon Road. Fire season got off to an ominous start Tuesday as Santa Ana winds fueled five brush fires across Southern California, including a 6,000-acre blaze that forced hundreds of residents to flee their homes in Ventura County. The blazes erupted like clockwork on the first day of autumn, which typically marks the beginning of Santa Ana winds. 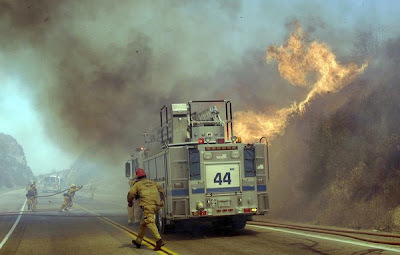 Firefighters braced for a tough week ahead with more unusually strong winds and extreme heat forecast through the end of the week. "We're in triple-digit temperatures and single-digit humidities . . . and it's beginning with a bang here," said climatologist William Patzert of the Jet Propulsion Laboratory. "There's not much good news." So far, nothing significant has flared up in San Diego County.